Whether you’re heading to downtown Milwaukee for a concert or checking into an Airbnb in one of the city’s vibrant neighborhoods, the Milwaukee County Transit System’s buses are the easiest way to get there. The system covers 90 percent of the county by bus, with routes linking popular attractions and entertainment districts, operating every 14-15 minutes, and extending into Washington, Waukesha and Ozaukee Counties, too. Bicycles are permitted and the fare is just $2.25 each way (additional cost for transfers). Charging $2.25 for each ride (cheaper rates are available via 10-pack tickets, a one-day pass, weekly pass or monthly bus pass), you can pay with cash on-board the bus or purchase tickets at a qualified retailer. A list of those 90 retailers is available on the Milwaukee County Transit System website. Note that rates fall significantly if you buy an M-CARD. These are sold at the same retailers that sell bus passes or you can save time by ordering online and having it sent to your house. The Milwaukee County Transit System does not operate 24/7—although it’s pretty close. Routes stop service between 3 a.m. and 4 a.m. in most cases. Consult the website for route schedules. If you’re in town for a week, the 7-day pass ($19.50) practically pays for itself as a round-trip ticket on the bus would normally run $5.50. Or, opt for a one-day pass ($4). Monthly passes ($72) are a bargain for regular bus-riders. You do not have to buy the monthly pass at the first month as it’s good for 31 days, starting on the day of your purchase. Newer to the Milwaukee County Transit System is traveling under the Ride MCTS App, which can be downloaded to smartphones. Using this app, 90 minutes of bus travel runs $2 and a 24-hour ticket is $5, which can be a good deal for travelers in Milwaukee who plan to get around solely by bus. Many people like using the app because you can track your bus in real time, save your favorite stops and view route maps with a few swipes. Flyers are bus routes targeting commuters who live in outlying counties. You’ll need to pay an Adult Premium Fare ($3.50) for these, or $6 for a one-day pass, $27 for a 7-day pass, or $96 for a 31-day pass. Riders who are 65 years of age or older, between the ages of six and 11, or have a qualifying disability pay discounted rates as follows on regular routes: $1.10 per trip; 1-day pass, $2; 7-day pass, $11; and monthly pass, $32. Visit the rates page on the Milwaukee County Transit System’s website to see how much you save on Freeway Flyer and Ozaukee County Express routes. Passengers with accessibility issues (such as being wheelchair-bound) find riding the bus routes a breeze thanks to all buses having a low-floor design and the ability to eject a wheelchair ramp for boarding and alighting. Drivers are happy to help passengers get situated in a dedicated seating area at the front of the bus. Cyclists can further widen their footprint thanks to storage space on the front of most buses (they hang on the exterior via a special rack that is easy to load and unload). Milwaukee is often referred to as the “city of festivals” during the summer months. All of these are hosted at Henry Maier Festival Park. Lots at or near the festival, whether it’s Irish Fest or German Fest, charge between $7-$25 so taking a special festival route on the bus really might be your best option. This page lists the festivals with dedicated shuttles. The Green Line takes you to and from Mitchell International Airport via a route that begins at Bayshore Town Center in Glendale. It drops passengers off within a short walk of the terminal (the airport operates just one terminal) and picks up outside of Baggage Claim at Exit 1, past the median and all the way to the left. The only other bus servicing the airport is Route 80. It starts at Centennial & Target in Oak Creek and ends at Villard & Appleton on Milwaukee’s West Side, with the airport between. When the Milwaukee Brewers play home games at Miller Park, which is on the near-west side of Milwaukee bordering Wauwatosa and West Allis, special Miller Park shuttles operate every 30 minutes for two hours before game time. Return bus service operates 30 minutes after the game ends. Twenty stops are on the route, which travels along Water Street, Cathedral Square and Wisconsin Avenue. Cash rates of $2.25 each trip apply and then you don’t have to deal with high costs for lot parking at the stadium. 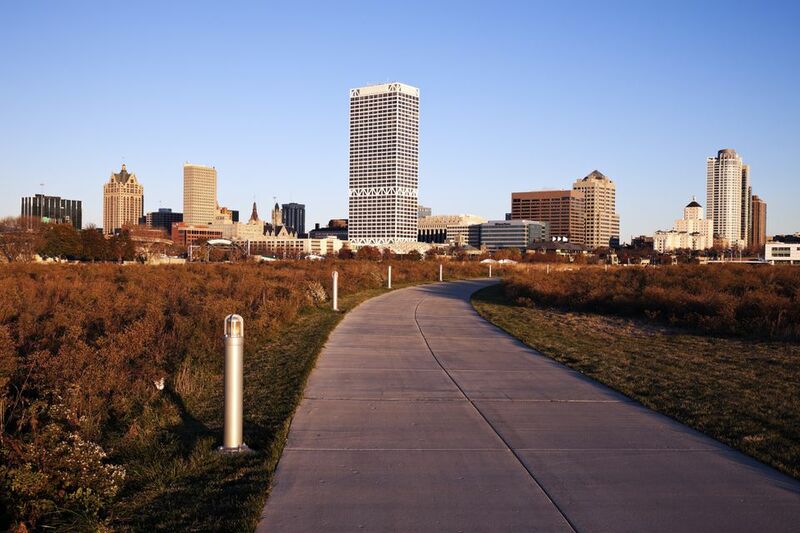 Milwaukee is extremely easy to get around on a bicycle thanks to plentiful bicycle lanes and the 125-mile Oak Leaf Trail, which runs through several neighborhoods and communities, including a gorgeous paved lakefront path between Bay View and South Milwaukee. Bublr is the shared-bicycle system within the city of Milwaukee. The cost to rent a bicycle is very affordable: a 24-hour pass costs $24 and a single ride $4. If you’re in town for longer, consider a 30-day pass ($15). New in late 2018 is the Hop, a streetcar servicing downtown Milwaukee and connecting with many Milwaukee County Transit System routes. It is free for the first year, beginning in November 2018. You can easily rent a car at Mitchell International Airport and will likely find that driving about Milwaukee never means being stuck in traffic for long. Even during morning and evening rush hours, it is not as terrible as other large U.S. cities. Zipcar has two downtown locations where you can “check out” a car for a short period of time. Schedules alter slightly (with less frequency) on holidays, Saturdays and Sundays so it’s best to consult the schedule before planning your trip. Consider Wisconsin winters: buses often run behind schedule during major storms. Unlike major cities like Chicago and New York City, bus ridership isn’t very popular in Milwaukee outside of rush-hour times so you may find daytime travel to be very pleasant and find a seat with no trouble.